Accident reconstruction of a motorcycle collision case is something that I have had to do, with the assistance of experts, many times in my capacity of a biker injury lawyer in Southern California. Oftentimes, motorcycles crash in urban areas like freeways or busy surface streets with heavily traversed intersections. In these cases, the ability to quickly obtain evidence from the scene and analyze these clues to what happened can mean the difference between being able to obtain maximum monetary compensation for the victim or having a case devalued due to lack of proof. Environmental Information: Careful examination and documentation of the accident scene within a short time frame from when the collision occurred is crucial. This includes not only where the crash actually happened but, also the pre-crash path of travel for all vehicles involved including the motorbike. The investigator(s) would want to look for things like visibility obstructions, estimated line-of-sight of all motor vehicle operators, conspicuous marks such as tire skids that may show attempts to brake by one or more vehicles, and notation of weather conditions such as a wet roadway, sun glare or other similar factors. All of these types of evidence are best documented by photographs and/or a written diagram of the accident scene. Such photos and drawings should include both the point of impact, where vehicles came to rest and the nature and layout of surrounding areas leading up to the crash site. Vehicular Evidence: All vehicles that were in any way involved in possibly causing the incident or colliding with the motorcycle or surrounding cars, should be examined and photographed for any conspicuous property damage. This would include dents, scrapes, scuffs, bent frames or forks (in the case of the motorcycle), rear end or front end damage, side scraping that may be indicative of the bike “laying down” and traveling some distance and other similar clues. Unfortunately, in auto v. motorcycle collisions, the car, truck or SUV can often drive away from the scene whereas the bike often cannot. Therefore, photographing motorcycle damage may be done at the scene of the accident and other vehicles may need be “tracked down” (i.e. at homes, tow yards, body shops, etc.) and examined and photographed. Personal Statements: Getting information from the motorcycle rider and the driver for any other vehicle involved can provide crucial information on the point of impact and what lead up to the collision. In addition, third party witnesses who were not involved in the crash can provide even better, less biased accounts of what happened. While statements from the involved parties (and sometimes other witnesses) are most often conducted by an investigating traffic officer and often (but not always) noted in the traffic collision report, the summary of these statements is usually terse. Being able to speak directly with both parties and witnesses and obtain more detailed information before these witnesses “disappear into the wood work”, can make a huge difference in obtaining proof of who caused the accident and who may be legally at fault. Helmet Analysis: The motorcycle helmet is not only the number one piece of safety equipment for the biker, it can also provide some of the best evidence of accident reconstruction and injury causation. 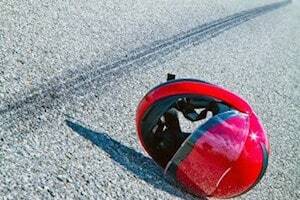 Punctures, scrapes and cracks in the helmet provide good information as to the point of impact of the rider’s head and the types of objects that may have been struck (ranging from portions of the motorcycle or other motor vehicle to the roadway). For example, depending upon the size, shape and location of a crack in the helmet, certain calculations can be made as to the pressure exerted. After the Fact Accident Scene Data: Oftentimes, the majority of the accident scene cannot be fully examined on the date of the incident. It is helpful to revisit the accident scene at or near the time of the collision (e.g. if the accident happened on a Wednesday morning during rush hour L.A. traffic, this would need to be simulated as much as possible). Noting traffic levels, weather conditions including sun glares, obstructions, direction of travel, signal patterns and many other facts can assist in reconstructing how the motorcycle impact occurred. While the traffic officers and any private investigators are charged with the majority of evidence gathering at the scene of a motorbike accident, forensic engineers familiar with accident reconstruction usually analyze this data and try to draw conclusions on causation. These expert opinions can then be used by the “trier of fact” (judge or jury) to determine who was legally at fault for the incident and who should be legally responsible to pay for any personal injury or property damage caused. Such experts gather all of the data and evidence obtained including the police report, medical reports, photographs and diagrams of the accident scene and the property damage, and review party and witness statements (both informal and obtained through a formal deposition process), and the traffic data and other information available about the locale of the crash. All of this is analyzed to determine things like speed and location of impact. For example, bent bike forks and dents on the front or side of a vehicle, coupled with skid marks and the point where a motorcycle came to rest are all “hard evidence” factors which can be cross checked against both the biker’s version of events and that of the other driver(s) or third party witnesses. Angles of impact, speed and many other determinations can be made from calculating mathematical modeling factors such as vectors components, loss of friction based upon the coefficient of friction of any roadway surface and many other calculations. The importance of seeking out the advice and experience of a California motorcycle accident and injury law firm familiar with accident reconstruction cannot be stressed enough. Attorney, Steven M. Sweat, has over 20 years of experience representing bikers in accident claims throughout the State of California including San Diego, Orange County and Los Angeles. Call today for a free contact us toll free: 866-966-5240.